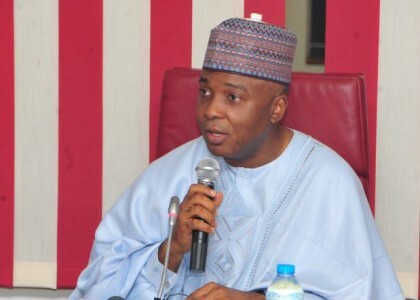 President of the Senate, Dr. Abubakar Bukola Saraki, on Tuesday applauded the Economic and Financial Crimes Commission (EFCC), for investigating and arresting a contractor who diverted 60 trucks of grains that were allocated to Internally Displaced Persons (IDPs) in Borno State by the Federal Government. In a statement by his Special Adviser on Media and Publicity, Yusuph Olaniyonu, on the arrest of the contractor, the Senate President denounced the actions of individuals who were attempting to enrich themselves off the plight of the IDPs, stating that it was unconscionable for anyone to attempt to defraud millions of displaced Nigerians in the North East that are on the verge of becoming malnourished. “I have been to the zone twice in the past 14 months and I have experienced firsthand that the IDPs need as much food as they can get. It is utterly immoral for someone to withhold food – in an attempt to enrich himself – while women and children are starving”, Saraki said. The Senate President, who called for a more comprehensive investigation of diverted materials to IDPs last week, further stated that in order to secure aid and funding from international partners, there was a need for a better coordinated response by the federal government to the situation in the North East. Saraki added that he was already making consultations on whether or not to call a Senate public hearing to deliberate on the government’s response to the IDP crisis, which many observers have called a looming humanitarian crisis – if not properly addressed. Speaking on the rumours that Boko Haram has begun recruiting young Nigerians from IDP camps, Saraki said that it was important for Nigeria’s intelligence apparatus to take such rumours seriously. Saraki also expressed optimism on the passage of the North East Development Commission (NEDC) Bill as he said the Senate was using the period of the recess to iron out the creases needed to ensure a smooth passage of the Bill.